We’d love your help. 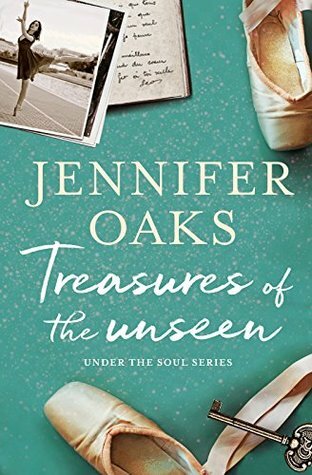 Let us know what’s wrong with this preview of Treasures of the Unseen by Jennifer Oaks. A shattered dream. A ruined romance. Can one dancer rediscover her heart’s passion? Gabrielle dreams of dancing her way to center stage just like her mother. In pursuit of her passion, she leaves her small hometown behind to find her own piece of the spotlight in the cutthroat big city. But her choreographed plans for the future misstep when a charming young man sweeps her off her feet. When an unlikely event tears her new love away, not even dance can heal her broken heart. On a journey to re-discover her purpose, she uncovers hidden secrets that change everything she thought she knew about her mother. With her world turned upside down, can Gabrielle pick up the pieces of her shattered dreams and learn to dance again or will she fade out of the spotlight? Treasures of the Unseen is a riveting literary exploration of one woman’s emotional quest. If you like richly woven characters, real-world relationships, and journeys of self-discovery, then you’ll love Jennifer Oaks’ deeply touching debut novel. To ask other readers questions about Treasures of the Unseen, please sign up. JENNIFER OAKS is an emerging author of contemporary fiction, who enjoys mixing real-life relationships with the pursuit of one's true calling while adding mystical elements to her stories. In high-school, she won a writing contest, and since then dreamt of becoming a writer. Treasures of the unseen is her first book. Currently living in Eastern Canada, she moved 30 times in 38 years. But the place JENNIFER OAKS is an emerging author of contemporary fiction, who enjoys mixing real-life relationships with the pursuit of one's true calling while adding mystical elements to her stories.